The Ohio Poultry Association (official state agency, NPIP) and the Ohio Department of Agriculture are combining efforts to organize Pullorum-Fowl Typhoid plate agglutination tester training classes. Whether your certification is due to expire or you have expressed interest in becoming a newly certified Pullorum tester, we are inviting you to participate in the training program. You must be 18 years of age to become a certified tester. There is a charge of $50 per student to offset program costs. There is an additional $5 fee for first time participants. Your certification is valid for 5 years. If your certification is due to expire in 2019, you will need to attend this training to maintain certification. If this is your first time being certified, you will physically test a bird. A BIRD WILL BE PROVIDED FOR YOU. DO NOT BRING ANY POULTRY TO THE CLASS. Each person needs to please bring a lawn chair to class as chairs may not be provided. Information on times and locations of classes as well as registration materials can be found here. 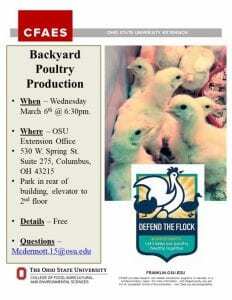 The 2019 Youth Poultry Clinic will be held on Saturday, April 13, 2019 at The Ohio State University ATI in Wooster. Topics for the day include: Avian Anatomy (Necropsy), Poultry Products/Processing, Broiler Selection, Quality Assurance, Housing, Waterfowl, Backyard Biosecurity, Digestive Health, Q & A Corner. Information and registration form can be found here. A Backyard Poultry Production class will be held on Wednesday, March 6th starting at 6:30pm at the Franklin County OSU Extension Office. This is a two-hour long class that will focus on small, backyard producers. We are now taking orders for the 2019 Turkey Pool at the Hartford Fair. The order form can be found here. Orders are due, with payment, to the Licking County Extension Office by Friday, March 1, 2019. Tentative pick-up date is Wednesday, April 3, 2019. An email will be sent out to all who order with the confirmed pick-up date. In order to be more consistent with statewide livestock exhibition ownership rules from the Ohio Department of Agriculture, the Ohio State Fair has modified ownership rules beginning with animals exhibited at the 2019 Ohio State Fair. Specifically, some market animals (swine, lambs, goats and poultry) will have ownership date changes. To help prepare exhibitors for this change, a list of these modified rules are below. Additional information can be found here.